Christine Malecki West of Kite Architects in Providence was on of the winners of the city’s Sustainable Housing Design Competition. The contest looked to design houses that were both environmentally sensitive and affordable. This house demonstrates that green design need not be eccentric to make a strong statement. Victorian houses throughout Providence provide a role model for simple forms that create opportunities for distinctive yet neighborly character through elements like this house’s entry tower. 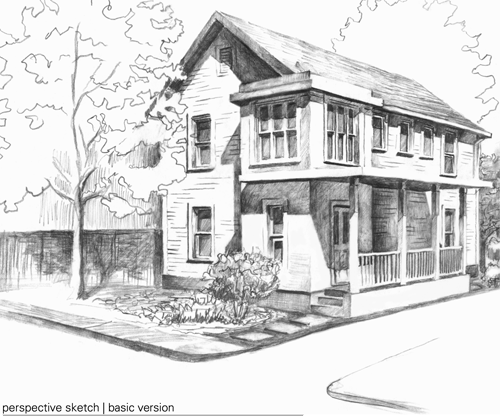 The alternate plan demonstrates how the proportions of the basic design allow dramatically different facades and roof styles. Unique tower “toppers” allow individual expression and an opportunity for exploration and learning, whether it is connecting to nature with star-gazing or plantings or a platform for wind-catching turbines. The design places a strong emphasis keeping energy use low. High efficiency cellulose insulation made from recycled newspaper provides exceptional efficiency. Natural ventilation is key to avoid wasteful air conditioning, and is entirely realistic with Rhode Island’s climate. The entry tower and loft above with its high-placed windows promote convection current, and large windows and bays promote cross-ventilation. The footprint is extremely compact yet the floor plan has clear and circulation and an open airy feel. The eat-in kitchen is ample and well-suited for families. Construction methods such as off-site panelization of otherwise standard wood framing, pre-engineered trusses instead of stick-construction, and placement of the central bearing wall to allow lightweight joists are not revolutionary but limit material waste. The site emphasizes permeable materials and drought-resistant ground cover that reduces water consumption. The drywell in the rear yard helps direct stormwater to our aquifers instead of the sewer system. Indoors, low-flow fixtures reduce water use. You can see more renderings and floorplans of Christine’s winning entry here. The judges said Christine’s house “demonstrates that green design need not be eccentric to make a strong statement.” While I’m a fan of modern design (and I believe Christine is too), I do enjoy how her winning design borrows from the Providence vernacular. I think it is important to show people that energy efficient design can feel familiar and need not be wrapped in a futuristic shell. Oh, by the way, I’d totally live in this house. Someone build me one please! I can’t find the plans anywhere! The links for PDFs for both winners are dead and a search at the Planning website turns up nothing. Has this stuff been removed? I fixed the download links here, you should be able to download the plans. The results are on the city’s planning department website somewhere, but the link I used seems to be resolving to the homepage.